Restores normal cholesterol and triglyceride levels and blood pressure, and improves blood flow to the heart. 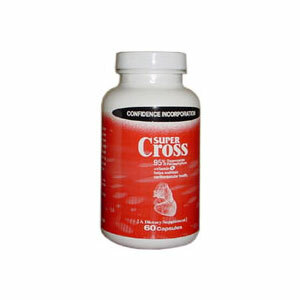 As an exclusive dietary supplement, SuperCross contains beneficial herbs and powerful antioxidants including CoQ10, Lycopene and Resveratrol in a natural base of standardized extraction and purity. The miracle herbs named Gynostemma Pentaphyllum and Tanshinone are rich in amino acids, antioxidants and minerals. This combination of nutrients provides nutritional support for maintaining cardiovascular health by restoring normal cholesterol and triglyceride levels and blood pressure, and improving blood flow to the heart. Talcum, Magnesium Stearate, and gelatin. People with moderate-to-severe heart problems should take 2 capsules 2 times a day before meals. For optimal results this product should be taken for at least 1 to 2 years. As a preventative supplement, take 1 capsule, 2 times a day.